If you’d like a signed book but don’t live nearby, you can call the store at 610-642-6274 to order one. There will be refreshments, and there will be a few other local authors in the house, who may be persuaded to sign their own books! In case of snowy or icy weather, I’ll post alternate instructions here on my blog, but let’s hope it doesn’t come to that, all righty? Especially since it snowed during the launch party for my first book. I’ve paid my weather dues! I often see misconceptions about what editing is. There's a tendency to associate it with proofreading or copy editing, which is the phase of editing that focuses on grammar, punctuation, spelling, basic consistency problems, word repetition, and the like. Copy editors know the difference between faze and phase. They know that you can't have two Saturdays in a row (unless that is one of the quirks of your invented world). But this is not the whole world of editing--far from it. Applying only this layer of editing to a manuscript is like frosting a bowl of cake batter, instead of waiting for the cake to come out of the oven. Editing is about looking at the manuscript on a global level as well. Does the pacing work, or does it drag in some places and race in others? Is there a central conflict, and is it resolved? Are there subplots, and do they relate to the central plot in a meaningful way, or are they just kind of stuck on as extras? Will readers become invested in these characters? Does the plot make sense; is it believable? Is there a theme or some answer to the "so what?" question? Is every scene necessary? Are we missing part of the story? And so on. This is the kind of editing that may result in adding or subtracting characters, moving scenes or chapters around, rewriting whole sections, chopping out other sections, adding scenes, introducing new events or deleting old ones. Yet a good editor doesn't impose a vision on a story, but rather suggests approaches that could enhance the author's vision. A good editor is open to the multiple approaches that an author can use in fixing a story. I never hand in a manuscript until I'm confident in it, until it has no flaws that I can see. And then the editorial letter opens doors in my mind. What I thought was a smoothly painted surface turns out, on closer inspection, to have chips and scratches and uneven spots. And sometimes I realize that the whole wall would look better if painted a different shade. This giveaway will run from now until January 31 (midnight EDT), as part of the Young Adult Giveaway Hop. If you'd like a signed copy of Try Not to Breathe, just leave a comment below including a way to reach you. One entry per person. One comment per person. Winner will be selected randomly from the entries received on or before midnight EDT on January 31 (i.e., the minute February 1 starts). In a must-read for any introverted writer who does public appearances, Jim Hines discusses the disorienting second-guessing and fatigue that can follow. Judging by the comment thread (which is also a must-read), a LOT of us do this: blurt, feel awkward, wonder how we come across. My take-home conclusion is that most people will never notice your awkward statement because they're too busy cringing over their own awkward statements. But no matter how I try, I still can't write in my journal when you're in the room. It's not even that I'm writing about you ... I just need to know that nobody's reading over my shoulder, about to ask me what I'm writing. I want to sequester this one part of me from everyone else. I think the difficulty [of writing a second book] comes from being reminded ... of how horrible and agonizing first drafts are. By the time your first novel comes out, it exists in your mind as this completed, fully polished thing, and so you fool yourself into thinking that the next one should come out like that, too. Artistic amnesia somehow makes you forget that before your first novel was sitting on the NEW FICTION shelf at a bookstore, it was an aimless train wreck of a Microsoft Word document that kept you up at night wishing you’d gotten a degree in accounting. And now for some comic relief: My books tend to be on the serious side (although not without some humor and hope). So just to change things up, I thought it would be fun to write a silly guest post for Jon Gibbs. The topic is "You may be a writer if ..." and includes such symptoms as, "You find yourself correcting the grammar and punctuation on signs, in song lyrics, and in advertisements." If you click over there, enjoy! 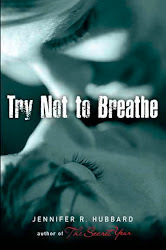 The charming Tracy D. is giving away a finished copy of Try Not to Breathe. I don't know whether to be more flattered by the fact that she purchased a copy to give away, or by the comparison to Ordinary People, but I'm thankful for both. In other giveaway news, Fire and Ice is giving away an advance copy of Try Not to Breathe (with the earlier cover). I'll also be giving away a copy of my latest book on this blog this weekend. Jo Knowles just blogged at engchat about a topic that's been on my mind since Try Not to Breathe came out--since before it came out, actually. Even though people know that novelists are writing fiction, i.e., stories that are not literally true, we seem to have a great hunger to know how much of a novel is based on true-life experience. As a reader, I know that hunger; I've felt it myself. We ask questions such as, This person who writes about the Gobi desert so evocatively ... has she ever really been there? And Jo points out another reason readers may be curious: because if the book tells the story of a problem they've lived through, they feel a connection with the teller of that story and want to know, Can I trust this connection? Is it real? Try Not to Breathe is the story of a boy's recovery from a suicide attempt, and his friendship with a girl who is seeking answers about her father's suicide. It is not my--or anyone's--literal life story. But the book was informed by my experiences living in this world, as well as by research. I made every word of the book as true and authentic as I could. Not at the surface level, with biographical facts about real people. But true on a deeper level. I used imaginary characters and an invented plotline to convey things I know and feel to be true, emotionally true, about life. For me, Try Not to Breathe is more about life and hope than anything else. That's the reality. My friend Kelly Fineman recommended this book to me first, and then I heard good things about it from a few other sources. Now that I've finally read it, I can officially say, Good call, Kelly. "It was welcome, so welcome, and in my rush to say that I loved you, too, I left the television on, I let that light bathe us for a little longer, as I returned to the couch, to you. We held there for awhile, not really sure what would happen next." "I would be standing right there, and you would walk out of the bathroom without putting the cap back on the toothpaste." "It was the way you said, 'I have something to tell you.' I could feel the magic drain from the room." I love the way the entries cover the full spectrum of a relationship's big and small moments: the giddiness of new love; the uncertainty of wondering whether it will last; the awkwardness of meeting each other's families; the quiet times throughout a relationship when love renews itself; the picky little idiosyncrasies through which lovers annoy each other; the joy of sharing inside jokes; the devastating times when the whole relationship is at risk of collapsing. For writers, it's also a good example of an unusual format, and an effective use of second person. Wow, The Lights in the Tunnel has one freaky mesmerizing cover. Interesting thesis about technology and employment. Does technology just change work, or does it actually reduce the amount of available work? "I think that every writer is two persons. The writer creates a second identity for themselves when they create novels." "Readers and writers need each other. They need to share the creative force that is the act of writing." It's what I love about being a writer, and being a reader. I have a lot to be thankful for this Thursday. That's Michelle Davidson Argyle, a Utah writer who took the time to get this photo of my first book in the wild and send it to me. It knocks me out that people do stuff like this. I'm thankful for every email and tweet and blog comment. I'm thankful for the support of family, friends, and fellow writers who have listened to me whine about how hard it is to write a book, and who celebrate with me when things go well. I'm thankful for the writers whose work inspires me. I'm thankful for the hard work done by my publisher and agency and booksellers and librarians to bring my stories to readers. I'm thankful for my husband, who is the chief enabler of my writing habit. I'm thankful that stories come to my brain, whether or not they ever get published or even finished. I'm thankful for the joy of writing. I'm thankful for every one of you reading this. To celebrate the launch of my second novel this Thursday, January 19, I'll be accepting comments on both of my blogs (LiveJournal and Blogger) all week on this post. Just leave a comment with a way to contact you by Friday night at 9 PM EST. I'll select a commenter at random to receive a $150 donation to your local library (or Friends of the Library, or literacy-related charity such as RIF). Also, the commenter will receive a signed copy of my book. More detailed rules are below. Also to celebrate: bookmarks for all! Just send an email to jennifer[at]jenniferhubbard[dot]com if you'd like a bookmark (rules on that below, too). 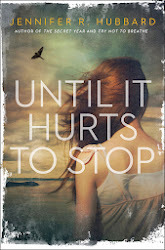 About Try Not to Breathe, a YA novel published by Viking (Penguin): In the summer after his suicide attempt, sixteen-year-old Ryan struggles with guilty secrets and befriends a girl who’s visiting psychics to try to reach her dead father. I wrote this book because I wanted to focus on recovery from a suicide attempt. What happens when someone steps back from that brink? How does he put his life back together? And so, while I certainly explore the darkness my character has walked through that brought him to that point, I see this book mostly as a story of learning how to live. If you'd like a more detailed discussion of it, see this analysis by Susan Carpenter of the Los Angeles Times. Last weekend, I went book shopping, to use a gift card I'd gotten over the holidays. Browsing the shelves made me so happy, as did carrying home my selections. I had heard that becoming a published author can ruin the bookstore experience. That authors can get upset if their books aren't stocked, and upset if they're stocked but are buried spine-out on a bottom shelf. The first few weeks after my book came out, I did have the weird sensation of blushing every time I crossed a bookstore threshold, as if spotlights were going to follow me while a loudspeaker blared: "THAT WOMAN IN AISLE 3 IS AN AUTHOR! SHE IS GOING TO CHECK AND SEE IF HER BOOK IS HERE! ISN'T THAT PATHETIC? AND CAN YOU BELIEVE SHE LEFT THE HOUSE IN THOSE PANTS?!" I'll be honest: I still do get a little blush-y if my book is there, and a little stomach-drop if it's not. But mostly, bookstores are still the places they always were: some of my favorite places on earth. I am, first and foremost, a reader. I'm still in love with the written word, and with other people's books. "[Joseph] Heller gave Wendy something more important, perhaps, than any single lesson he might have imparted in class or perceptive comment he might have scribbled on a paper. He made her feel that she had something special to offer. This endorsement was a powerful antidote to the sense of failure that weighed on her ..."
I've seen this idea expressed over and over in writer's-journey stories, and I imagine it's common in the wider range of success stories as well. So many of us have gotten a boost to our spirits from someone who said, "I believe in you. You have what it takes." Constructive criticism is valuable. But we also need our mentors, our cheerleaders, the people who stick by us when the going gets tough and we don't know if we can keep going. Some days, a well-timed compliment works wonders. Stories are rich in choices. Here I'm referring to characters' choices, although certainly writers face many choices as they construct a story. Braless in Wonderland, by Debbie Reed Fischer: Should Allee go to college right away as she has always planned, or take a detour to pursue modeling offers, which will allow her to travel? Bunheads, by Sophie Flack: Is Hannah satisfied with focusing single-mindedly on her dance career just when she is starting to see success, or does she want to have time and energy to explore other interests? The Day Before, by Lisa Schroeder: Should Cade and Amber follow through with life-changing obligations, or escape and keep their current lives intact? The love triangle is a classic example of a choice often found in books. Then there are, in the most extreme examples of choice, the life-or-death decisions such as those in Unwind (Neal Shusterman), Crash Into Me (Albert Borris), and The Hunger Games (Suzanne Collins). I've been thinking about choices because I have a two-part short story in the January and February issues of Cricket Magazine. (You can read a summary of the January issue here--my story is the one about Everest.) Central to that story is the main character's choice of whether to pursue his dreams, even if it means defying his mother and taking risks--and his mother's choice of how much to allow him to do. I struggled with the ending to the story and initially left it much more open-ended, but the editor encouraged me to take the next step, to follow through, to document the characters' decisions. And so I made a choice that was, for me, almost as scary as the characters'. As a writer, choice can be scary because we risk disappointing some readers. If the two possibilities are equally compelling, then the road not taken will have fans (notice how the participants in love triangles even have "teams" rooting for each of them?). But that can be positive, too. I think there's value in allowing readers to ask, "What would have happened if the character had chosen the other option?" Throughout 2011, I posted a series of authors' "second book" stories on this blog. I was fascinated by the process of writing a second book, partly because I had just written mine, partly because sophomore books tend to be written under a very different set of circumstances from debut books. I would like to thank, once more, those authors who shared their stories: Caragh M. O'Brien, Saundra Mitchell, Rosanne Parry, Leah Cypess, Marie Lamba, E.F. (Eileen) Watkins, Ellen Jensen Abbott, Greg Fishbone, Lauren Bjorkman, and M. Flagg. Every author had unique challenges, joys, and perspectives, just as every author seemed to feel both the pressures and the opportunities present in the sophomore novel. And here, with my second book launching in less than two weeks, I thought I would share my own second-book story. I alternated writing The Secret Year with another manuscript, which I'll refer to here as "Problem Child," because if our books are like children, that manuscript was certainly my problem child. Problem Child had a narrator I loved and a central conflict that I thought was very important. It also had a setting based on a place in which I lived for eight years, a setting I knew very well and haven't seen much of in YA literature. Anyway, when I got stuck with The Secret Year I would work on Problem Child for a while, and vice versa. There were times during this period that I thought Problem Child would be finished first, and it might be my first novel. But it was The Secret Year that took wing, found me an agent, and got me a book deal. I thought I had the second-book problem covered: I had a manuscript that was very far along, after all. Problem Child had already been through countless drafts and revisions. I sent it to my agent, who had comments--comments I agreed with, by and large, because something about the book still didn't feel exactly right. In revising the book, I decided I had overwritten it during all those rewritings, and I pared it down to what I thought were the most interesting parts. I did wonder if that made the book too thin, even skeletal, but by this time I had lost all perspective on it. My agent thought that hacking the novel to the bone did indeed make it too thin. I was bored with the book because I knew every word in it by heart, but readers would need more meat. I tackled Problem Child once again. At the same time, a New Idea came to me, and I wrote a draft of New Idea very quickly, in between toiling on drafts of Problem Child. At about this time, when my agent and I were discussing when we might want to submit Problem Child (assuming I could ever get it in good enough shape), I told him about New Idea. I had been wondering how Problem Child would be received by readers of The Secret Year; New Idea seemed a much more natural follow-up. I did not tell my agent this, just summarized New Idea for him, and he asked how I would feel about working on New Idea to get into submittable shape, and put Problem Child third in the rotation. In other words, he independently came to the same conclusion I had. I was relieved, then excited. I loved New Idea, and the thought of working on Problem Child any more made we want to puke. New Idea had its own momentum; it was a story I'd had in the back of my head for years, and it came roaring out as if it knew it needed to be the next book. New Idea became a book called Try Not to Breathe, and it comes out this month. And what of Problem Child? One reason I didn't give up on it sooner was that something about it kept nagging at me, kept wanting to be told. After I finished Try Not to Breathe, I worked on it a bit more, to see what was there, and I reached the point where I've finally written it out of my system. 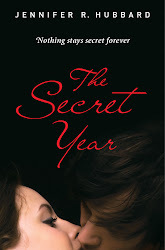 It's a decent book, but it's not in the same league as The Secret Year or Try Not to Breathe, and I don't want it out there with my name on it. I've tried to figure out why it doesn't quite work. One of my critiquers says the setting doesn't feel believable, which is funny because, as I said, I lived in that setting. But since I didn't live there as a high schooler, maybe that's the trouble. There's one character in particular, the main antagonist, who I worry about "othering" on one hand, or making too sympathetic on the other. I also think I may have married this setting to the wrong plot; perhaps I will use this setting in a different work, and I will use this plot with different characters. I've come to recognize that the character of Nicki in Try Not to Breathe is very much like a character in Problem Child, so you could say I've already started mining Problem Child for its best aspects, to use in other stories. Our story ideas aren't really dead until we're dead, so there's also a chance I will someday have the Eureka moment on how to fix Problem Child, and will return to it and revise it one last time. For now it's on the shelf, along with other manuscripts I attempted before The Secret Year, and I am quite happy to leave it there. So in some ways, my second book was impossibly difficult (Problem Child). In other ways, it was incredibly smooth and quick (Try Not to Breathe). Try Not to Breathe is the book that almost wrote itself. I put in plenty of hours on it, and in the early drafts I wandered around for a while in some early chapters that ended up getting cut, and I had to make a couple of big changes during revision. But overall, the story and the characters had a strength and a life that made them impossible for me to ignore. This is the book I can stand behind. Recently, there was a month called December. I'm pretty sure it lasted 31 whole days, but to me it was an eye-blink. I had a few things going on: major work on a current manuscript, preparation for an upcoming book launch (featured on Eve's Fan Garden this week, including a giveaway), and celebrating holidays with my family. Also, I have a day job. There came a point where I had to say no to anything new. There were opportunities I would've liked to take, things I would have liked to do, people I would have liked to get to know better, but I literally didn't have the time or energy. I had reached my limit, and rather than exceed that limit, I said no. It's hard not to feel guilty about this, but in December, I really didn't have a choice. It was a matter of survival. I bring this up because I've heard Laurie Halse Anderson speak about the need to say no, to understand that we can't do everything all the time. I have called her speech to mind many times as I juggled my workload--and as I took necessary breaks, such as watching a movie with my husband on New Year's Eve. I remember that as I plan out my nearly-as-busy January. So for anyone out there who feels as if they're struggling with too many tasks, too many obligations, I pass along the message: It's okay to say no. It's okay to take the phone off the hook (or send the calls straight to Voice Mail, to update that saying a bit!). It's not too much to ask that you get to sleep, to shower, to see your children before they grow up. And to write that story that's been sitting in your brain all this time, waiting. Books like this require a reader to do some work, make an investment, trust the author. Not every reader is willing to do that.There are readers who hunger for experimental works, who love that challenge, but they will always be a subset of the audience. And so, as a writer, it's safer to write a very accessible, traditional text. And yet, as a reader, I find that experimental works often give me the biggest payoff. A Clockwork Orange, for instance. I wrote short stories for years, and I didn't distort the traditional story-telling style at first. There were so many stories I wanted to tell, and so much to learn about telling them! It took a few years before I wanted to fool around with form. First I nibbled a bit: Very short stories. Very long stories. Stories in the second person. Then I grew a bit more daring: Cut-line prose. Stories that mimicked other forms of writing. Repetitive lines. A vague narrator whose identity was open to reader interpretation. Invented language. I've been taking the same journey in novels. I'm still writing traditionally, but I'm toying with the idea of playing with form a bit more in some future project. The digital world will probably open up all sorts of possibilities: ways to integrate words with pictures, sound, video; ways to change the linear flow of a story; etc., etc. But I don't want to be gimmicky about it. I want the form to mean something to the story; I want that form to be the best way to tell that story. In A Clockwork Orange, Anthony Burgess didn't invent a lot of words just to try to be cute, or clever, or obscure. He skewed the language for a reason, and he chose to base his language on Russian for a reason. As a reader or a writer, sometimes a challenge can be fun. My first link is to Natalie Whipple's post on the role work plays in our writing life. Sometimes we get so caught up in thinking about talent and luck and the actions of others--all the things we can't control--that we forget the part we can control: the work. The practice, the trial and error, the sheer hours and sweat we can put in. As Natalie writes: "Lots of people tell me I'm talented at certain things now, but I know the truth and am mostly proud of that truth. There was very little talent involved ... If I want to be good at something, the only way for me to get it is through hard work and endurance." Interestingly, I encountered that same idea in another place just this past week, when I finally got around to reading the highly recommended MG novel A Crooked Kind of Perfect (Linda Urban). The main character, Zoe, wants to be a musical prodigy. But music doesn't come easy to her, and she decides she might as well quit. Then she hears a radio interview of a young musician who plays beautifully ... as a result of practicing four hours a day. Zoe says, "Who knew you'd have to work four hours a day to make something sound so easy?" Finally, I'll note that the "Eve's Fan Garden" site is featuring my upcoming novel, Try Not to Breathe, as the book of the week. There are several features, including a giveaway, so check that out if you're interested.